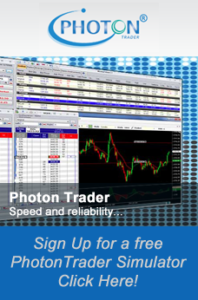 PhotonTrader is a software and technology company headquartered in Chicago that caters to a wide variety of Futures, FOREX and Security traders looking for an execution advantage. The infrastructure is in place to service and support its current customers. Most importantly, it has been configured to be expandable and scalable to meet the investment industry’s continually expanding technology needs. Over 23,000 hours of programming went into building the new PhotonTrader Software, Photon API, and the Photon Options front end. PhotonTrader is rich with features and data connectivity options that can be customized to accommodate any type of trader or strategy. PhotonTrader Services provides access to PhotonTrader through multiple FCM’s and IB partners, and links to over 20 exchanges globally. Platform pricing is very competitive to keep costs low and maximize performance for all levels of traders; from Individuals to Institutional Investors. Sign up for a simulator and watch our tutorial videos to see the cutting edge advantage of PhotonTrader in action! PhotonTrader Services is building an educational section that will offer trading tutorials, trading Webinars and trading forums. Damon Pavlatos, the founder of PhotonTrader Services has 40 years in the Trading industry. Damon will be leveraging his relationships to bring in some of the most successful Traders and trading educators to help the trading community.